Asian markets continued its southbound journey after Dow fell 1.1% overnight and commodity prices plunged on mounting fears about euro-zone debt troubles and Fitch’s downgrade of 5 major European groups. Concern about Asia’s economic health also contributed to the sell-off following lower-than-expected China’s and Japan manufacturing reports. Mirroring negative vibes from abroad, KLCI tumbled as much as 14.6 points to 1448.5 before bargain hunting on selective bluechips spurred the KLCI into a marginal 1-pt gain at 1464.1. The local bourse displayed some resilience yesterday as it managed to recouped a 14.6-pt loss to end 1-pt marginally higher and closed above the uptrend line support, despite overnight Dow Jones’ fall and sluggish regional markets. We remain cautiously optimistic that the KLCI is likely to offer some counterbalance to the uncertainty in Europe and advocate the strategy of buy on weakness and take profits in any rebound, in anticipation of year-end window dressing activities, potential Chinese New Year and pre-election rallies as well as sufficient domestic catalysts and fiscal stimuli that will support a modest economic growth in 2012. 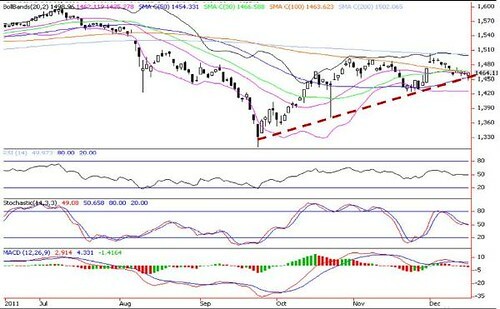 Immediate crucial support is the 50-d SMA or uptrend line (1454). A breakdown of 1454 would mean that the rally from 1311 low (Sep 26) is likely exhausted and will head toward lower Bollinger band (1426) and 61.8% FR (1420) supports. Resistance levels are 10-d SMA (1476), 38.2% FR (1487) and 200-d SMA (1502).